It seems Arsenal are close to putting an end to their wait for a new sporting director as reports suggest that they are on the verge of employing Monchi. The position became necessary following the departure of Sven Mislintat from the club earlier this month. The football trainer occupied the spot of the head of recruitment for just fourteen months during which he helped with the signing of Pierre-Emerick Aubameyang, Konstantinos Mavropanus, Lucas Torreira, Bernd Leno among others. According to II Messega, the North London club have reached out to the AS Roma director of football, Ramón Rodríguez Verdejo, otherwise known as Monchi, and he has agreed to join them before the end of the season as long as they can activate his £2million buy-out clause which they are willing to pay. 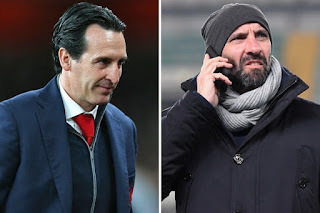 It is another chance for Monchi to work with Unai Emery after they both had a successful reign in Spain with Sevilla. In the 16 years he spent there, the former goalkeeper won a total of eleven trophies for them while also helping them become a top half club in the La Liga. His experience will help Arsenal record more progress and with him, the struggles for silverware could be over.